Refer official Art Discount Website to view full Terms & Conditions. Be it for kids or adults, your creative ideas should not be stopped, it should be given wings and Art Discount is there to supply you with all the needs of your creativity. Art Discount is a part of Grantham which has over 100 years of history in the graphics business and is a leading supplier of art and graphic materials to both amateurs, professional and commercial users throughout the U.K.
From oil paints, acrylic paints, spray paints, palettes, and knives, brushes, pen, pencils, sketchbooks to various other art accessories, you will find everything in a wide range of collection. Apart from various options, you also get everything here at discounted prices. Moreover, add more discount by applying Art Discount promo code at the time of placing an order. If you are willing to awake your inner artist but not able to find the right direction, now you have Art Discount student area. Here, you will find an interesting course to sharpen your art and graphics skills. Art Discount gives you another chance to save through free delivery. If your order subtotal reaches over £45 for the UK postcodes, you will not be charged for any additional expense. You will receive your order within 3-4 working days. Below that extra cost of £3.95 will be applicable on order up to £30 and £4.50 will be applicable on order up to £44.99. Yet, you can try to find an Art Discount free delivery code and enjoy the service for free on below minimum level. If you are confused regarding what to gift your beloved, surprise your art lover friend with the gift card. The recipient can then buy any of art essential of her choice from the wide range of collection. The card is available ranging from £10 to £200. So, it is a winning situation for you as you can gift the card in your strict budget also. While redeeming the gift card suggest them to apply Art Discount promo codes to get extra discount on their cart total. How to Use Art Discount Promo Codes? Copy a suitable Art Discount promo code from this page which meets your preferred product requirement. 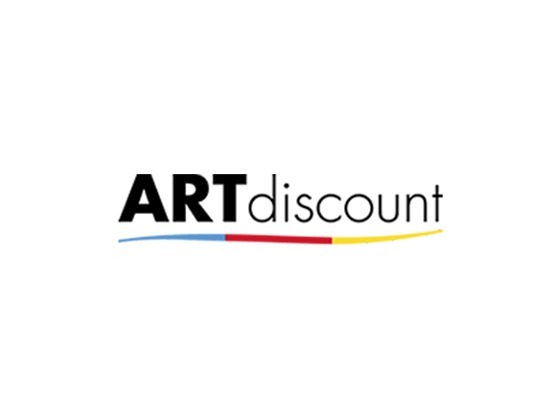 Visit artdiscount.co.uk and browse through the collection of various art products. Add the products you wish to purchase in the shopping cart. Now, fill out your contact information and shipping address and besides that, you will see a box asking for the gift card or discount code. Paste the code here and your total amount will be deducted according to the code. Next, choose a shipping method and confirm the order by completing the payment. Register for the newsletter and you could win a £50 gift voucher. Entries will be drawn on the first Monday of each month. Moreover, you will also receive the exclusive Art Discount promo codes and offers, new releases, sales, articles, etc. by this newsletter straight into your email. Also, stay connected to Art Discount community by following it on Facebook, Twitter, Instagram, Pinterest, YouTube and learn interesting art and graphics from other people.